The American Dental Association today released six reports examining the economic viability of three models of so-called “midlevel” dental providers, the Dental Health Aide Therapists (DHATs) currently providing care in Alaska Native territories, the Dental Therapists (DTs), currently working in Minnesota, and the proposed but as yet unrealized Advanced Dental Hygiene Practitioner (ADHP). 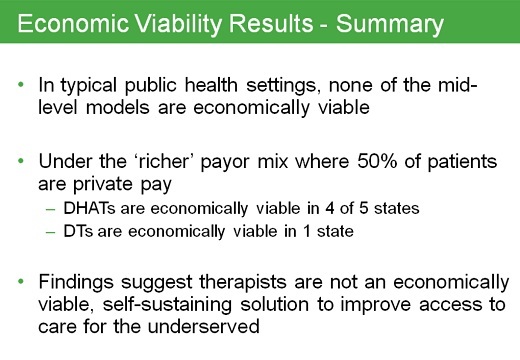 The reports raise serious questions about whether these midlevel provider models can sustain themselves economically. Connecticut, Kansas, Maine, New Hampshire and Washington. A five-state summary report also is available. Of the 45 scenarios modeled (three payer mixes for each of three practice models in five states), only five indicated positive net revenues, ranging from $8,000 in Kansas to $38,000 in Connecticut, assuming a 50/50 mix of public and private fees. Four positive net revenue scenarios involved the Dental Health Aide Therapist model; one involved the Dental Therapist model. The other 40 scenarios showed net losses ranging from $1,000 for a DHAT operating on a 50 public/50 private mix in Washington to $176,000 for an ADHP practicing in the same state, assuming a 75/25 public/sliding revenue mix. “It is critical to understand that oral health disparities are a complex set of problems requiring an integrated set of solutions,” said Dr. Calnon. “Medicaid reforms, community water fluoridation, oral health education and helping people overcome cultural, geographic and language barriers are critical components of this. The ADA believes that allowing nondentists to perform irreversible surgical procedures is the wrong way to go. And based on these studies, midlevel dental providers would in most settings be unable to generate sufficient revenue to sustain themselves absent a continual source of financial underwriting. Given the current budget constraints at every level of government, and the already insufficient financing for dental care in most states, midlevel providers do not appear to be viable. I was invited to an American Dental Association webinar and the screencap summary chart above was taken from the presentation. 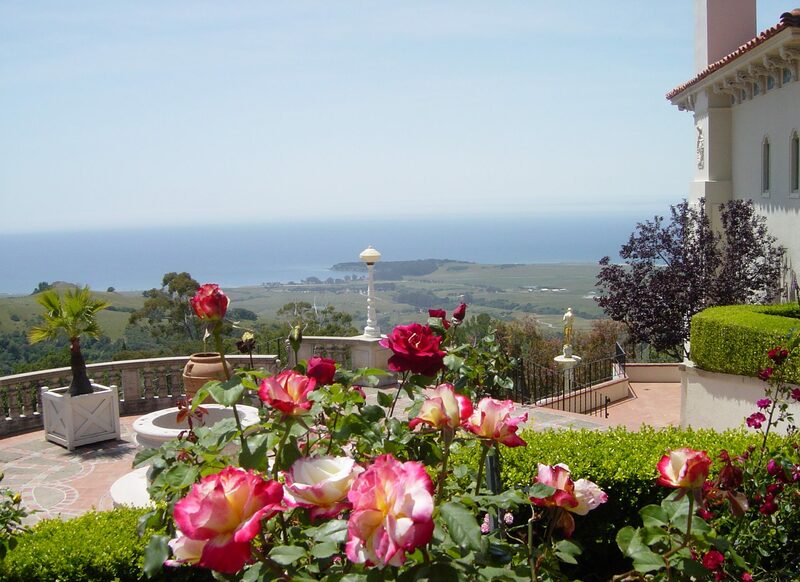 A link to the embargoed summary report is here. I will have more later, after digesting the reports and the webinar presentation. 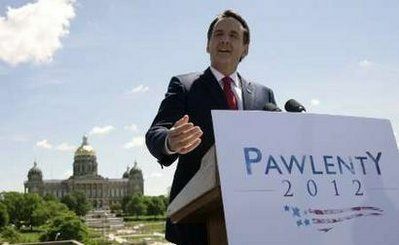 President 2012: Is Tim Pawlenty A Friend of Dentists? The legislative battle over what have come to be known as “midlevel providers” in Minnesota has come to a close. 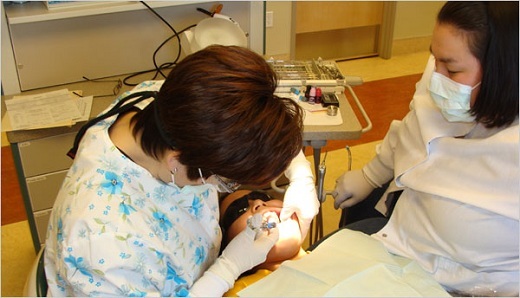 What began as two distinct models of education and practice emerged as one with the state creating a new position—the dental therapist—who will provide care for underserved patient populations in the state. Gov. Tim Pawlenty signed Senate File 2083 May 16, creating the dental therapist, a licensed provider with a bachelor’s degree in dental therapy who will work with Minnesota-licensed dentists to provide preventive dental services, restoration of primary and permanent teeth, extraction of primary teeth and select other dental treatments. Governor Pawlenty signed the legislation and now will be held accountable. Pawlenty is not a fan of dentistry no matter how the American Dental Association or anyone else spins it. He could have vetoed the legislation. Dental therapists or mid-level providers will fracture American dentistry into multiple tiers of care and help undermine private practice while increasing Big Government control of my profession. Sorry, Tim. I will support and vote for someone else.